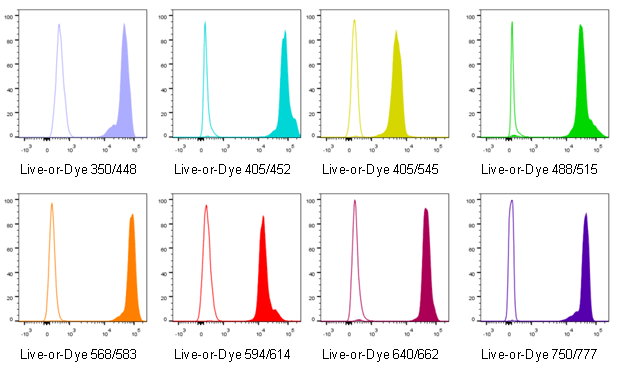 Live-or-Dye™ Fixable Viability Staining Kits are designed for discrimination between live and dead cells during flow cytometry. Live/dead stains are useful probes to include when analyzing cell surface protein expression by flow cytometry, because they allow intracellular fluorescence signal from dead cells with permeable plasma membranes to be excluded from analysis. In microscopy, live/dead stains allow unambiguous visual discrimination of dead cells. Live-or-Dye™ Fixable Viability Stains are cell membrane impermeable amine-reactive dyes. The dyes enter dead cells that have compromised membrane integrity and covalently label free amines on intracellular proteins. On live cells, the dyes react with surface proteins, but these are much less abundant than intracellular proteins, resulting in low staining levels compared to dead cells (Figure 1). Live-or-Dye™ labeling is extremely stable, allowing the cells to be fixed and permeabilized without loss of fluorescence or dye transfer between cells. The staining protocol has been optimized to maximize live/dead discrimination with minimal live cell staining, in order to prevent interference with immunostaining. Biotium offers a selection of eight bright and photostable Live-or-Dye™ stains for maximal flexibility in multi-color analysis. We also offer Live-or-Dye NucFix™ Red, a unique fixable nuclear-specific dead cell stain. Principle of Live-or-Dye™ discrimination of live and dead cells. Choose from eight bright Live-Or-Dye™ stains for flow cytometry. Live (open peaks) or heat-killed (solid peaks) Jurkat cells stained with Live-or-Dye™ Fixable Viability Stains and analyzed by flow cytometry. Results are comparable for live or fixed/permeabilized cells. Four bright and photostable Live-or-Dye™ stains are validated for microscopy. Ethanol-treated HeLa cells stained with Live-or-Dye™ Fixable Dead Cell Stains. Dead cells stain brightly with Live-or-Dye™, while live cells show minimal staining. Nuclei are stained with Hoechst (blue). Live-or-Dye NucFix™ Red is a unique, cell membrane impermeable dye that specifically stains the nuclei of dead cells. Unlike other commonly used nuclear stains such as propidium iodide or DRAQ7™, Live-or-Dye NucFix™ labeling is covalent, so the dye doesn’t transfer between cells after fixation. Live-or-Dye NucFix™ Red can be used for flow cytometry or fluorescence microscopy. 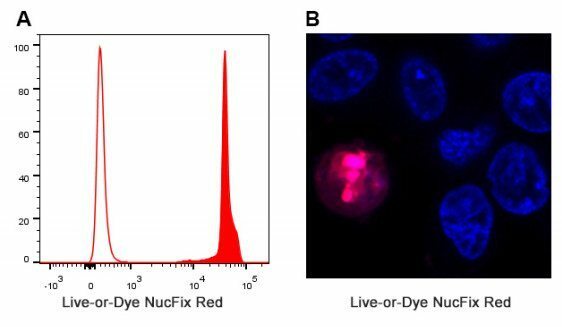 Discrimination of live and dead cells using Live-or-Dye NucFix™ Red Fixable Viability Stain. A. Flow cytometry of live (open peak) or heat-killed (solid peak) Jurkat cells stained with Live-or-Dye NucFix™ Red. B. Ethanol-treated HeLa cells stained with NucFix™ Red. Killed cells show bright red nuclear staining, compared to no staining seen in live cells. Nuclei are stained with Hoechst (blue). Also see our other Products for Flow Cytometry. Draq7 is a trademark of Biostatus, Ltd. Texas Red and Pacific Blue are registered trademarks of Thermo Fisher Scientific. Cy dye is a registered trademark of GE Healthcare.